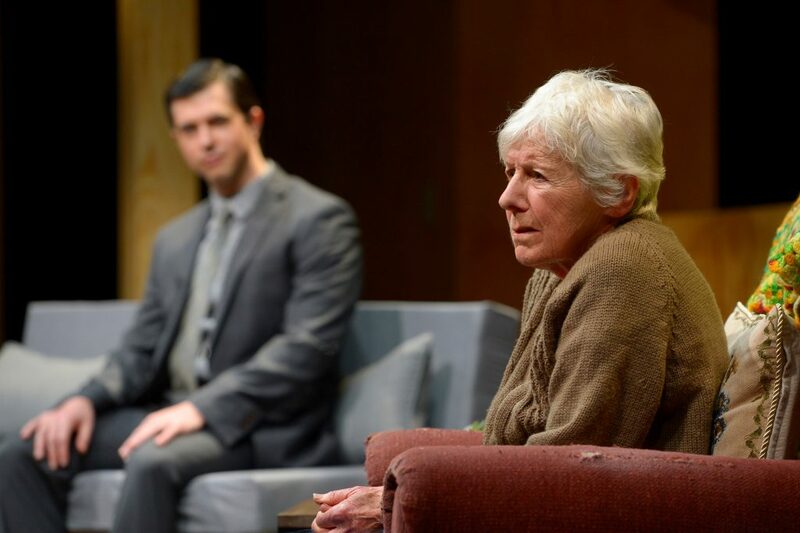 Jordan Harrison’s 2015 Pulitzer-finalist play “Marjorie Prime” opens with a living room conversation between Marjorie, in her ancient, tattered armchair, and Walter, on a sleek, narrow sofa. Although Marjorie is in her eighties and Walter is about 30, it’s soon apparent that they are looking back on their marriage. Walter is a Prime, a computer-generated holographic being who exists to learn and then share Marjorie’s memories with her. Since Marjorie is losing her mental abilities along with the physical ones, her daughter, Tess, and son-in-law, Jon, have brought Walter in to provide companionship and keep her engaged, in touch with the landmarks of her life. Walter comments that Marjorie was the most beautiful woman in their town. “It was a small town,” he adds humorously, “but you were its queen.” A continuing theme is the European tennis player, “eighth in the world,” who pursued her even after she chose Walter. Her warm-hearted husband disagrees; in fact, he considers it an act of kindness to tell Walter—and thus Marjorie—that her early suitor was a high-ranking French tennis pro, not the American shlub with a small business that he was. Then there are the deeply painful events that no one ever talks about. Tess has her own complicated memories, unaddressed feelings, and complex relationships, not least (of course) with her mother. We come to feel she wants Marjorie to recall things that actually occurred, not the rosy, edited version, so that the two can, maybe, discuss and resolve them. 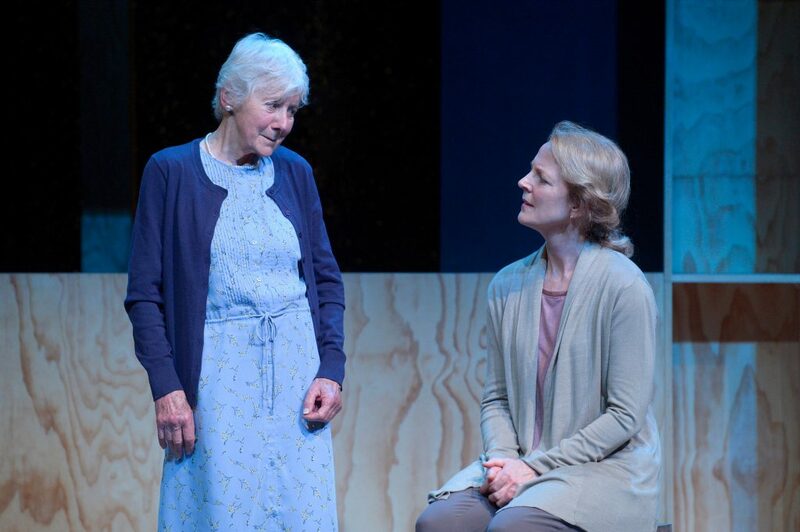 So, the play raises interesting questions about the value and accuracy of memories, who gets to alter or repress them, how much of that we do unconsciously (perhaps in a healthy way), and the role they play in our relations with others. 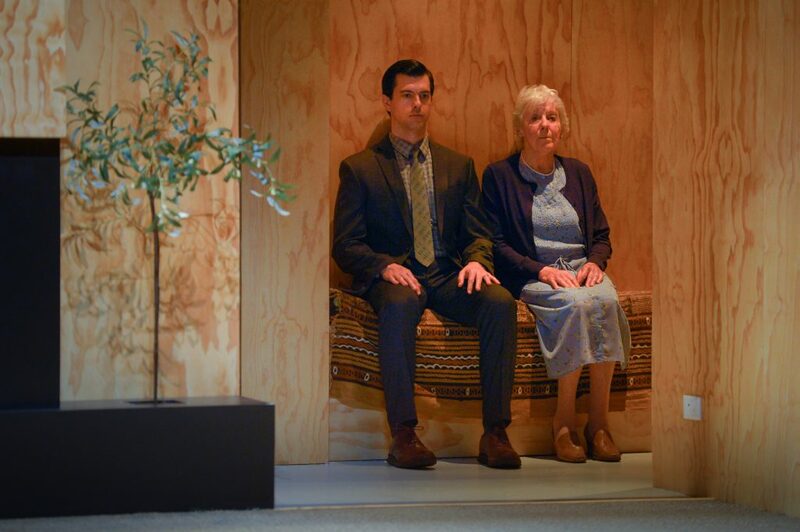 In a high-tech, futuristic context, “Marjorie Prime” deals with the most basic human emotions. The play isn’t particularly subtle, but the story is consistently interesting as it slowly unfolds, and there is no need to hammer any points home. I much prefer a scene like one that came and went in a few seconds, when Jon comes in to find Tess sitting alone, opens his mouth to say something, changes his mind, and the stage goes black. All four performers inhabit their roles wonderfully well. Joy Carlin is a delight to watch as she muddles through her failing memories and lights up whenever she recalls something (or thinks she does). 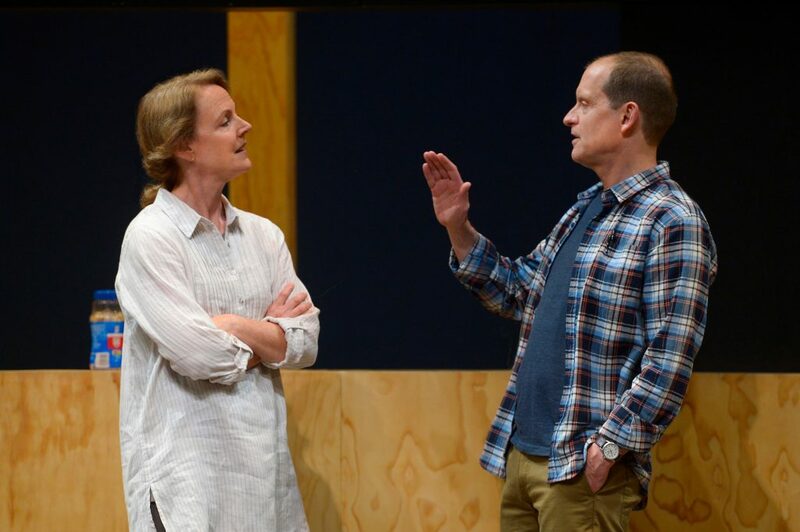 Julie Eccles, in some ways the heart of the play, is an off-putting, harsh, yet (come to find) suffering Tess; she looks like a different person when she’s not unhappy. As Jon, Anthony Fusco adeptly conveys a man who has his own complex feelings, especially in a powerful later scene. Joining the three veteran actors is Tommy Gorrebeeck, excellent in the difficult job of seeming human but not. The runs of MTC productions tend to be extended, but scheduling constraints mean that this one will not. 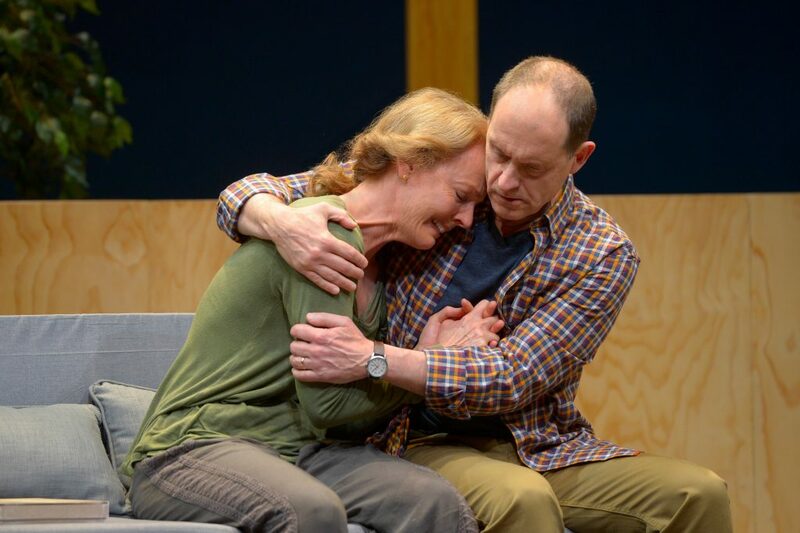 So, if you want to see this production of “Marjorie Prime”—and you should—take note that it ends in less than three weeks. 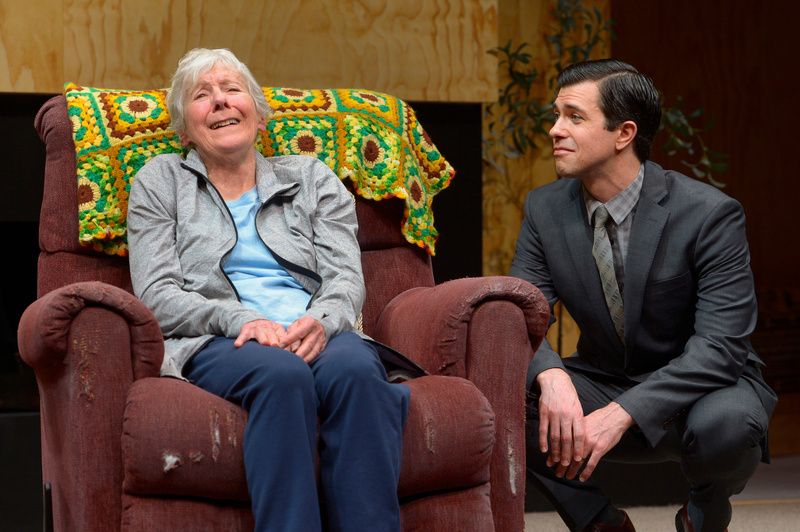 Cast: Joy Carlin, Julie Eccles, Anthony Fusco, and Tommy Gorrebeeck. “All the Shah’s Men” Highlights CIA Conspiracy in Iran Coup, at Arabian Shakes, S.F.